We've had a lot of rain the past couple of weeks, so the main mid/upper delta river systems are high and muddy. This makes it difficult to fish because the water runs deep into the woods into inaccessible areas. If you're fishing the delta, try to find clearer water, run-offs, or higher bank real estate that isn't flooded. The lower river systems, Dog River and Fowl River aren't effected as badly from the rain. Fishing there should be business as usual, with maybe a little water muddiness. Any docks in the creek arms of these rivers usually produce good fish using soft plastic. If you're looking for a good chance at a trophy bass and don't have a boat, try bank fishing Langan (Municipal) Park. There are monster bass there. The more rain, the better here. When the water is high and muddy, the big'uns get up close to the bank to feed in the flooded areas. Texas-rigged senkos/lizards & spinnerbaits do well here. 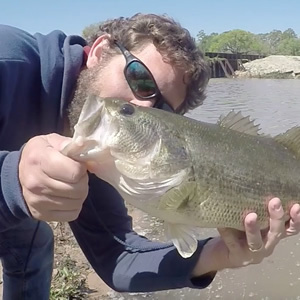 If you're looking for the extreme Mobile Alabama bass fishing challenge, go fish Big Creek Lake. Due to it's gin clear waters, you'll likely do better fishing deeper than you're used to (8ft-20ft), well off the bank. Underwater topography and structure is KEY in this lake. Trolling rapalas and carolina rigged plastics are favorites here.